Individually made to your design. At Lloyd & Co. Blacksmiths we pride ourselves on making products that are individually made and to a standard that will last a lifetime, this is certainly true with our weathervanes. Each one is hand crafted in our rural Dorset forge using the highest quality materials and finishes. Whether you are looking for a weathervane to sit on your garden shed or on top of a cathedral, we can work closely with you to produce a unique design for any size or budget. A weathervane should be something unique and meaningful to the owner. To achieve that we are happy to work from photos, sketches or even an idea you have in your mind to come up with a design that means something to you. How the weathervane attaches to your chosen building will depend on the situation. We can make up many different types of fixings to suit your needs. Please get in contact with your requirements. 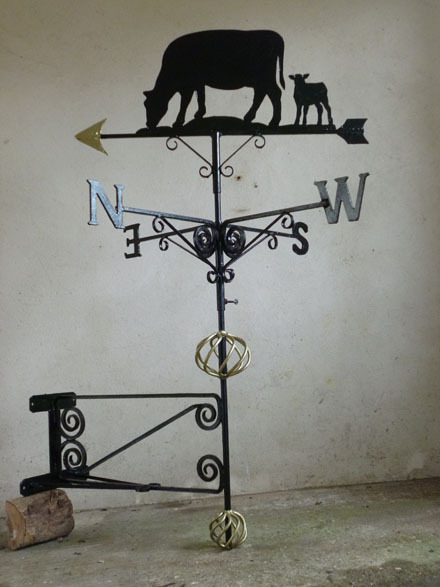 All weathervanes are individually hand made and can be delivered direct to your home. From start to finish they take around 4 weeks to complete. Please feel free to get in contact for an informal chat to discuss your requirements.